1 1. Know the name and explain the purpose of the various parts of a bicycle. 2 2. Repair a punctured bicycle tire. 9 Set innertube aside when all punctures have been patched to allow a few minutes for the cement to set and your patch to adhere. 11 3. Take apart, clean, and properly reassemble a bicycle. 12 4. Adjust the brakes and front and rear derailleur properly. 13 5. Know and practice courtesy and safety rules in bicycling. 14 6. What is the advantage of wearing a cycling helmet? 16 8. Know how to read a road map by routing out your 50-mile (80.6 km) course and following it accurately on an actual ride. The Cycling Honor is a component of the Sportsman Master Award . 1. 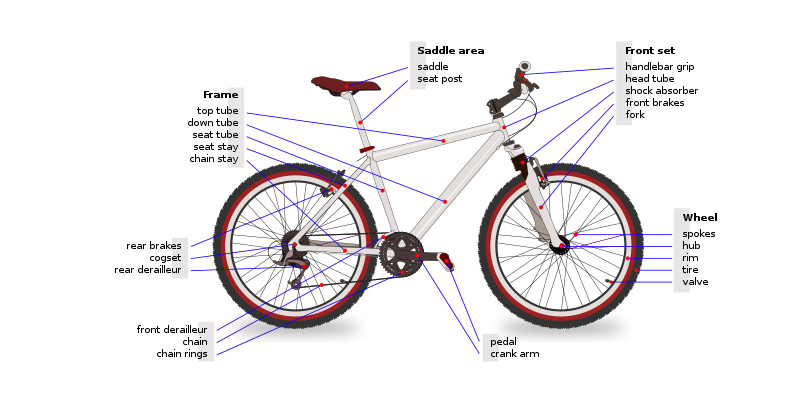 Know the name and explain the purpose of the various parts of a bicycle. Cassette- There are up to 10 sprockets of increasing size attached to a hub housing making up a modular cassette. This housing is slipped over an outward extending splined part of the hub. The rear hub is a "freewheel" (ratcheted so the wheel is pulled around when pedaling, but allowing the wheel to spin freely while you coast). The chain is shifted from one sprocket to another by moving the right shifter lever to activate the rear derailleur. Chainstay- Lower bar on portion of frame that attaches rear wheel. If there's no second tube on dual suspension bike, it is referred to as a swing arm. 2. Repair a punctured bicycle tire. 3. Take apart, clean, and properly reassemble a bicycle. At first glance this appears to be a big task with bits left over after the reassembly. For this requirement all that is intended is the ability to remove both wheels to aid giving the bike a good clean. A more detailed disassembly is required in the advanced honor (cleaning bearings & regreasing). Even in the advanced honor taking apart a bike completely is not intended. 4. Adjust the brakes and front and rear derailleur properly. Most bicycle brakes use a lever on the handlebars to pull a cable: that cable draws together a pair of brake arms, pressing the brake blocks (aka pads or shoes) against the rim of the wheel. Friction between the blocks and the rim is what slows the bike down. First, check that your tires are inflated to their correct state, since any faulty pessures will confuse your efforts. Check that you have good brake blocks and rims. Rims should be free of corrosion and dirt, and the brake blocks should be appropriate for the rim. Replace worn blocks in pairs. To clean steel rims of rust, use wire wool. Avoid getting harsh cleaning products on the tires. Degreasers may corrode rubber. Leather-faced blocks are best for steel rims. Do not get oil, grease or wax on the rims or blocks. Excess dirt on rims and blocks will make them wear out faster. The rubber brake blocks need to be aligned with the metal rims, but the leading edge of each block should be slightly closer to the rim than the trailing edge. This prevents brake squealing and is called "toeing-in". Use a coin or piece of thin cardboard under the back end of the block as a spacer when adjusting. Some suggest tying an elastic band temporarily to the trailing end of the block instead of a spacer. To make the adjustment, slacken the screw holding the block then swing the brake arm in so that the block is pressed sqarely against the metal rim, then retighten it with your "toeing-in" device in place. Do one block at a time. When both blocks are aligned correctly, decide whether the distance of the blocks from the rims is correct by trying the feel of the brake lever, or by reference to your handbook. V-brakes might need only a 1mm gap, while others will have different settings. If a significant adjustment is needed, it should be done by resetting the cable length, but if a small change will do then use the handlebar barrel adjusters, installed near the brake levers. To reset the cable length slacken the brake cable clamp and let the brake side arms relax. Adjust the position of the blocks by moving in both of the side arms until the blocks nearly touch the rims. Retighten the cable in the clamp. This may take a couple of tries to get the blocks close to, but not touching, the rim. A fine adjustment may be made with the barrel adjuster. If not on the handlebars it may be near the brake blocks. A locknut keeps the adjustment in place. If the brakes just need a small adjustment, this fine adjustment may be all you need. Screwing the barrel adjusters all the way in before making brake adjusments will allow the widest range of outward adjustments at a later date, though leaving a couple of threads showing on the adjuster will allow a slight inward adjustment of the blocks if it is needed. Rotate the wheel to check brake clearance. If it slows too soon then some thing is rubbing. A regular, periodic rubbing when the wheel is spun indicates that the wheel is out of true and needs to be trued. (See: Truing a bicycle wheel.). Sometimes the blocks just need moved out minutely. For side-pull and centre-pull brakes, slacken the central retaining bolt and correct the position of the whole brake assembly. For cantilever and V-brake systems, there is a spring-tension adjusting screw on one or both of the arms. Adjust these to bring both arms into balance. Screw it in to move the block further out. 5. Know and practice courtesy and safety rules in bicycling. Wear a Helmet Bicyclists and bicycle passengers under 18 years old are required to wear helmets. Always carry identification. Especially when riding alone, carry identification with your name, address and an emergency phone number. Always ride with traffic. This is the law. Motorists are not looking for bicyclists riding on the wrong side of the road. Observe stop signs, signals and basic right-of-way-rules. Bicycle riders on public streets have the same rights and responsibilities as automobile drivers. Cyclists are part of the normal traffic flow and are entitled to share the road with other drivers. Like drivers, bicyclists must yield to pedestrians. Keep clear of the door zone. Try to ride a door’s width away from parked cars. If you have to ride in the door zone, ride very slowly. You have the right to ride in a traffic lane if it is too narrow to share with a car. Use hand signals. Hand signals tell motorists what you intend to do. Signalling is a matter of law, of courtesy, and of self-protection. Keep both hands ready to brake. You may not stop in time if you brake one-handed. Allow extra distance for stopping in the rain and heavy fog, since brakes are less efficient when wet. Ride a well equipped bike. Be sure your bike is adjusted to fit you properly. For safety and efficiency, outfit it with a bell, rear-view mirror, rack or basket, lights and reflector. Carry a water bottle, bike pump and patch kit. Wear a helmet. Keep your bike in good working order. Don’t weave between parked cars. Don’t ride out to the curb between parked cars, unless they are far apart. Motorists may not see you when you try to move back into traffic. Follow lane markings. Make left and right turns in the same way that cars do, using the same turn lanes. DO pull over if you need to use your cellphone. 6. What is the advantage of wearing a cycling helmet? A helmet is a form of protective gear worn on the head. Traditionally, helmets have been made of metal. In recent decades helmets made from resin or plastic and typically reinforced with Aramid fiber (e.g. Twaron or Kevlar) have become preferred for most applications. Designed for protection of the head in combat, or in civilian life, from sports injuries, falling objects or high-speed collisions. Helmets are common in the military, construction, mining, and some sports, including American football, baseball,, ski, snowboarding, ice hockey, equestrian sports, motorsports, and rock climbing. Motorcycle helmets and bicycle helmets are compulsory headgear in some jurisdictions; in the United Kingdom only Sikhs are allowed to ride motorcycles without wearing motorcycle helmets. Bicycle helmet compulsion and even strong promotion has been a heated subject of debate amongst cyclists and scientists since at least the 1990s, lately focusing on alleged net protective effect at the population level. Bicycle Helmet Safety Institute : Helmet info. Thoughts from Texas Department of Transportation : Wear a properly fitting helmet to reduce the chances of head injury and death. In some places, city or county law requires it. a. Take three separate 10-mile (16.1 km) rides in different locations. b. Take a 50-mile (80.6 km) ride in ten hours or less. 8. Know how to read a road map by routing out your 50-mile (80.6 km) course and following it accurately on an actual ride. Create your own routes using google maps!